“Engagement” is a key curatorial concept for Catching Light. Between artists, between visitors and art, between art and how we respond to it. Implicit in this principle of interaction as affect is the specific participation associated with art animated by electricity, which makes this exhibition fitting as part of ISEA 2013. And if it was simply an exhibition of electronic art in a regional gallery, with the remit of introducing an historical spectrum of media art to a broader and less predictable audience, Catching Light would have adequately acquitted its cultural and community responsibilities. But what makes it a significant event regardless of its association with ISEA is its curatorial ingenuity. Five creative “innovators from the analogue and early digital eras” (Linda Dement, Tom Ellard, Troy Innocent, Stephen Jones and Wade Marynowsky) have mentored and collaborated with “new generation” artists (Kelly Doley, Paul Greedy, Benjamin Kolaitis, Pia van Gelder and Michael Candy) in dialogue to do with where we have been and are going. The result is a suite of new works informed by a rich history, innovative stuff made in 2013 that sits cheek by jowl with important precursory experiments in and recognised milestones of what were then “the media arts,” such as Severed Heads’ 1984 video Goodbye Tonsils and Troy Innocent’s world of artificial life, Iconica (1998). This creative convergence, in the vision of curators Michael Dagostino and Megan Monte, is significant and memorable as a merging of one generation of media arts practice with another. Indeed Dagostino suggests that the impetus for the bringing together of emerging and established artists was motivated by a sense of having heard so much about pioneering works of the 1980s and 1990s but never having experienced them. This exhibition was the means of going back in time to capture that lost light. But whether through design or happenstance Catching Light highlights something deeper and more profound to do with media art history, the languages of interactivity and the future of this chimera called media art. In particular the works exhibited attest to the waning of spatial interactivity as a cultural paradigm in the face of the resurgence of a dominant time-based audio-visuality. After Sean Cubitt, and with a polite nod to Jacques Derrida, it is videography that is emerging as the dominant art form of mediated art: the predominance of a time-based screen apparatus of moving images that can, or has been, manipulated with the spatial manipulation of analogue/digital forms (it’s curious and not a little disconcerting that the finalists of the 2013 Anne Landa Award for “new media art” at the Art Gallery of New South Wales are time-based, predominantly video works that require no interaction from their audience). Accordingly in the wrestling ring-like stadium of Troy Innocent’s and Ben Kolaitis’ Play Parameters (2013) competitors tussle with “playing sticks” to colonise a digital territory that manifests as light on the playing surface, blurring the distinction between game-play and playing electronic music. Wade Marynowsky’s and Michael Candy’s colloquially named Fish and Chips (2013) features beautifully made kinetic sculptures inspired by the designs of Leonardo Da Vinci. Mobilised into the otherworldliness of the ocean floor by divers in the accompanying video documentation, these obscure objects of desire seek to attract fish with the automated sound of rocks hitting each other. In Tom Ellard’s and Paul Greedy’s Home Clavilux (2013) the coloured doodles made on a sensitive pad by the visitor metamorphose on a separate screen into elegant vapours of luminous affect that resemble x-rays of bodily humours captured in real-time. 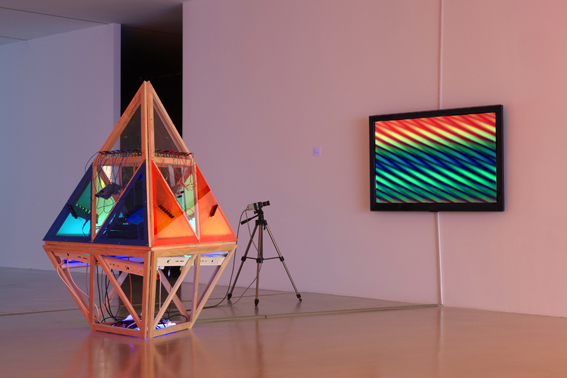 Stephen Jones’ and Pia van Gelder’s Tetrasynth (2013) is a kind of pataphysical machine of unknown possibilities, a hybrid of analogue and digital video synthesis. At once contemporary and vestigial, the weird issue of machineries of joy that bend light, it is a fitting emblem for this exhibition. Such works represent the changing poetics of interactivity, figured as a dialogue between artists from the past and present about the ongoing language of media art. And that sense of change through time is suggested in the title of this review. Letters stretch and prolong the formation of parts into meaningful wholes, foregrounding the elongated intervals in time and space that make language possible. But it is in its sense of entropy, of something that struggles to keep going, that also gestures to Linda Dement’s and Kelly Doley’s extraordinarily powerful 50 beats (2013). This deceptively simple but confronting work is the audio-visual correlative of the complacent denial of feminism in culture. There is an overwhelming sense of loss here that makes the installation also bristle with frustration and anger. In an urgent situation of code red, the in extremis rendition of Helen Reddy’s “I Am Woman” envelops the semi-darkened space. Agonizingly slowed down to fifty beats per minute, the time signature of a human heart close to failure, this soundtrack has gone horribly awry. 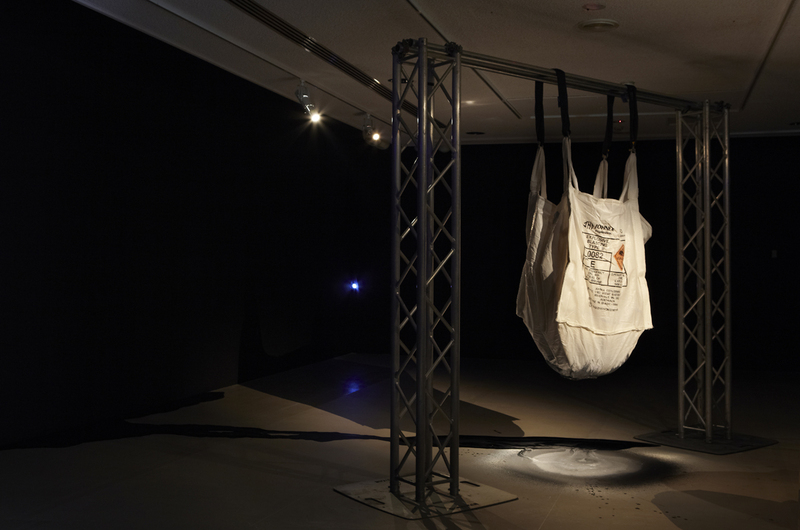 In the presence of this sonic evacuation of human life and female politics an undifferentiated sludge drips from a half-tonne explosives bag suspended from an industrial frame, oozing with uncomfortable slowness into a bland and utilitarian bucket. Text on a myopically small screen screams urgent messages of outrage and warning as the feminist body politic crawls towards oblivion. Both animus and activism are reduced to a melancholy waning that is nonetheless tinged by the threat of explosion. Only when you look down do you realise you are standing in that threatening ooze. The canny insight that motivates Catching Light garners this perception of generational change into coalitions of the analogue and the digital, emergent understandings of history and the practices of the techno-arts as cyclical and dynamic, never fixed or static. The current International Symposium on Electronic Art being held in Sydney, of which Catching Light is a part, attests to this feedback loop of change. As the only international city to host ISEA twice, previously inviting the Inter-Society for the Electronic Arts to its shores in 1992, Sydney again becomes a time-space event of the artifice, innovation, dysfunction and obsolescence associated with the changing hues of digital light.